Notable insider buys: CTI Industries Corp., DISH Network, Independent Bank, Guaranty Bancshares, and Switch, Inc. Notable insider sales: Inspire Medical, Facebook, Salesforce.com, ServiceNow, and CarGurus. 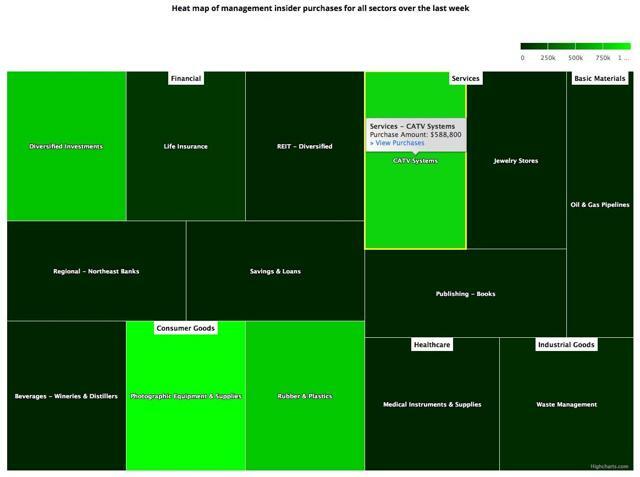 Insider buying increased last week but remained lackluster overall with insiders purchasing $11.46 million of stock compared to $7.58 million in the week prior. Selling declined with insiders selling $356.43 million of stock last week compared to $464.73 million in the week prior. Sell/Buy Ratio: The insider Sell/Buy ratio is calculated by dividing the total insider sales in a given week by total insider purchases that week. The adjusted ratio for last week dropped to 31.09. In other words, insiders sold more than 31 times as much stock as they purchased. The Sell/Buy ratio this week compares favorably with the prior week when the ratio stood at 61.31. Note: As mentioned in the first post in this series, certain industries have their preferred metrics such as same store sales for retailers, funds from operations (FFO) for REITs and revenue per available room (RevPAR) for hotels that provide a better basis for comparison than simple valuation metrics. However, metrics like Price/Earnings, Price/Sales and Enterprise Value/EBITDA included below should provide a good starting point for analyzing the majority of stocks. Chairman John H. Schwan acquired 180,723 shares of this rubber & plastics company, paying $3.32 per share for a total amount of $600,000. Mr. Schwan increased his stake by 21.97% to 1,003,439 shares with this purchase. This microcap company that primarily makes balloons and vacuum sealing products under the Ziploc brand, reported a loss when it announced third quarter 2018 results in November but expressed optimism for its fourth quarter on account of lower operating expenses. On the negative side, the company has nearly $22 in net debt on the balance sheet and had to defer a subscription rights offering due to market conditions. The company "reclassified related long-term debt as current on the balance sheet and discusses its presumption of operating as a going concern in the footnotes of its financial statements." Executive Vice President James DeFranco acquired 20,000 shares of DISH Network, paying $29.44 per share for a total amount of $588,800. Mr. DeFranco increased his stake by 1.38% to 1,473,529 shares with this purchase. Director Donald L. Poarch acquired 10,000 shares of this regional bank, paying $52.48 per share for a total amount of $524,850. Mr. Poarch increased his stake by 8.70% to 125,000 shares with this purchase. 5,000 of these shares were purchased indirectly by the Poarch Family Limited Partnership. These transactions were filed a couple of months after the purchase. Director Richard W. Baker acquired 10,000 shares of this bank holding company, paying $28.83 per share for a total amount of $288,300. Mr. Baker increased his stake by 2.78% to 370,000 shares with this purchase. This transaction was filed a month after the purchase. Director Thomas A. Thomas acquired 15,000 shares of this co-location and data center company, paying $7.99 per share for a total amount of $119,925. Mr. Thomas increased his stake by 40.22% to 52,291 shares with this purchase. This transaction was filed a couple of months after the purchase and this is his second open market purchase since we started tracking insider data more than eight years ago. Switch priced its IPO at $17/share in October 2017 and after experiencing a first day bump that saw its stock price jump to an intra-day high of $24.90, it has been pretty much downhill for the stock since then. Revenue growth has moderated in each of the last three quarters, falling as low as 5.2% in Q3 2018 and the company missed both top line and bottom line estimates in each of the last three quarters. In this age of virtual servers dominated by offerings from AWS, Azure and Google Cloud, it is not surprising to see a traditional data center company find it difficult to grow its business. On the positive side, Mr. Thomas has been on the board of Switch since its founding and the company significantly stepped up CapEx in 2017 and 2018, potentially pointing to higher revenue growth in the next few quarters. Director Joyce Erony sold 352,275 shares for $53.68, generating $18.91 million from the sale. These shares were sold indirectly by Amzak Health. Chief Financial Officer Richard Buchholz sold 6,000 shares for $54.18, generating $325,080 from the sale. These shares were sold as a result of exercising options immediately prior to the sale. Chief Operating Officer Sheryl Sandberg sold 55,000 shares of Facebook for $144.93, generating $7.97 million from the sale. These shares were sold indirectly through a trust. Chairman of the Board & co-CEO Marc Benioff sold 25,000 shares for $149.59, generating $3.73 million from the sale. President and CFO Mark J. Hawkins sold 9,067 shares for $149.96, generating $1.36 million from the sale. Co-Founder and CTO Parker Harris sold 6,331 shares for $149.43, generating $946,046 from the sale. These shares were sold as a result of exercising options immediately prior to the sale. Co-CEO Keith Block sold 5,000 shares for $149.97, generating $749,873 from the sale. These shares were sold as a result of exercising options immediately prior to the sale. Pres. and Chief People Officer Cynthia G. Robbins sold 490 shares for $149.15, generating $73,082 from the sale. These shares were sold as a result of exercising options immediately prior to the sale. Pres., Legal & General Counsel Amy E. Weaver sold 456 shares for $149.15, generating $68,011 from the sale. These shares were sold as a result of exercising options immediately prior to the sale. President, Technology Srinivas Tallapragada sold 362 shares for $149.15, generating $53,992 from the sale. These shares were sold as a result of exercising options immediately prior to the sale. Director John Victor Roos sold 228 shares for $149.10, generating $33,995 from the sale. Director Frederic B. Luddy sold 32,500 shares of this software application company for $189.76, generating $6.17 million from the sale. These shares were sold indirectly through various trusts. Chief Technology Officer Oliver Ian Chrzan sold 120,000 shares of this online auto shopping provider for $40.00, generating $4.79 million from the sale.